Richard Jim Number Eight Turquoise Row Bracelet size 5 7/8"
Richard Jim has created a new group of bracelets using the heaviest gauge Sterling we've ever seen. This silver is thicker than 10 gauge Sterling sheet. We love a heavy bracelet because they feel so good when they fit snugly; very solid but never feel heavy when the fit is right. 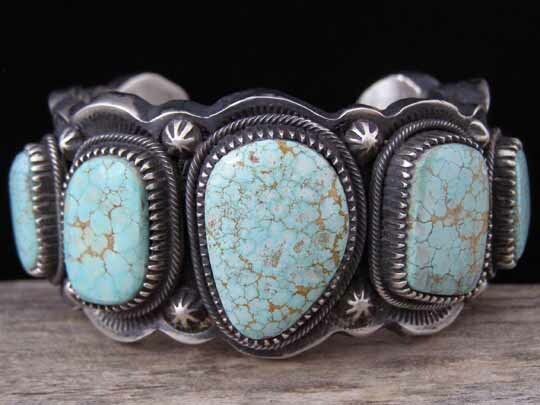 This bracelet has scalloped edges and is set with five free-form stones of natural, untreated Number Eight turquoise. These are perfectly matched stones exhibiting classic cinnamon-colored matrix. The stones are set in handmade serrated bezels which are wrapped with twisted square wire. Starred buttons are interspersed between the stone settings along each edge of the cuff. Appliqueés frame the set of stones and deep stampwork decorates the cuff to the gap. Inside the cuff, horizontal bands of deep stampwork add decorative detail. There's no adjusting this; it's simply too heavy to bend or alter its size. Use a tailor's tape measure and verify that your wrist measures 5 7/8" or 6". If it's your size, you'll love it--but there is no guessing--please measure! Stones: center 18" x 11/16"; left & right 3/4" x 1/2"; far left & far right 5/8" x 3/8"
Width of cuff in front: 1 5/16"
Terminal to terminal: 4 7/8"
Total inside circumference (including gap): 5 7/8"